India woke up to a new beginning that will soon make the black shadows lurking around its economic well-being a thing of the past. A landmark decision by the Government of India to demonetise Rs500 and Rs1,000 notes is sure to be emblazoned in the annals of modern India's history. This bold move is nothing but a sort of capital punishment meted out to all these malpractices, especially in the real estate segment, says a research note. In the report, Liases Foras Real Estate Ratings and Research Pvt Ltd, says, "Land has always been one of the favourite assets to park black money. In the absence of black money, hoarders will not find it appealing to purchase land and demand will be dented. As a result, landowners are likely to be more willing to negotiate prices. We anticipate land prices to witness around 25%-30% price correction. Tier II and Tier III markets and perhaps some Tier I markets, where plotted development is rampant, are likely to be most affected by this." According to the non-brokerage research centric firm without a large amount of cash at their disposal, builders will be left with no option but to reduce prices and use sales proceeds for completion of construction. This, it feels may impact the pace of construction to some extent, but price points are likely to become more productive over the medium to long-term. Luxury housing is going to take a big time hit as large transactions were happening in black. Developers catering to this segment are sure to face liquidity pressure, it added. Real estate as a sector has been one of the major dumping grounds for unaccounted money and counterfeit currency, also known as black money in common parlance. Whether it is procuring land parcels, obtaining clearances and approvals from Government authorities or even purchasing regular construction material, black money and corruption has flown through the Indian realty seamlessly. As a common practice, even buyers had been paying a substantial black component while purchasing properties in the primary as well as secondary markets. Black money led to speculative practices, which led to artificially inflated prices. An overheated real estate sector created a vicious cycle and brought inefficiencies in its wake. As per Liases Foras estimates, secondary or resale market is expected to be worst hit because a lot of transactions in that segment happen in cash with sellers wanting to avoid long-term capital gains (LTCG) tax. Small and unorganised developers and other fly-by-night builders may just be reduced to a miniscule percentage as non-compliance has always been an issue there, it added. Concisely Liases Foras says, this (demonetisation) is the quintessential surgical strike - sharp and perfectly timed. It says, "Not only will it (demonetisation) usher in an era of efficient pricing in real estate and increase involvement of end-users, it will also tackle deep-rooted issues of red-tape on the approval front. Developers will face reduced delays in securing approvals and this will result in faster completion of construction in the long-term. This is a bold step in eradicating black money from the financial system and if it achieves the desired outcome, real estate will be the biggest beneficiary. Ultimately, real estate is one such sector that truly reflects the face of economy. 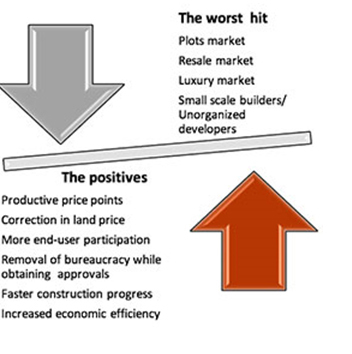 The more transparent and strong an economy is, the better it augurs for the health of the real estate market." "When the initial jitters and knee-jerk reactions fade away, a bigger and brighter picture of the Indian economy will gradually emerge in all its glory. An economy devoid of black money and corruption has been every Indian's dream, and we hope to experience it for real," Liases Foras concluded. We must wait & watch . This sector is used to making 40% profit , most of the big guns are over leveraged . Cash flow will be impacted . If Banks gets more deposits , i hope they will show prudence in lending which will in turn reset this sector . One swallow doesn't make a summer. Let's not got lost in a euphoria. Despite so much hullabaloo from the day one (8.11.16), no news of any big fish having been netted so far so as to believe that the so called surgical strike on currency ban has had its objectives fulfilled, except that some old currency notes have been replaced by new. But the reports are that those who stacked and hoarded the old notes have been deftly replacing them with ease in myriad ways, without being exposed. Unless the politicians who double up as builders, realtors, stockists, traders, educationists, etc., are cornered and their illegitimate gains confiscated, economy cannot be expected to improve. The best indicator of the government's move may be a fall in the prices of essential commodities. If that happens, the government deserves the credit. About 8 years ago, when I laughed at the seller, if as merchant navy officer of 30 yrs at sea can't afford his plot, then who will. He laughed right back at me and said "what are you talking about! People are going around with gunny bags with 1000 rupee notes to buy". Shocked myself learned about Container Money Economy of Kerala. Now my mind is at peace. I stand a chance in financial life. Hitting out at Tata Sons for the holding company's allegations over expenses and impairment through a full-page newspaper advertising, the office of Cyrus P Mistry says this is 'another brazen attempt to mislead the public and shareholders." The statement from Mr Mistry's office also raises the issue of Niira Radia's public relations work for the Tata Group and entire office cost of Mr Ratan Tata, including the usage of corporate jet. It also appears that the group is spending a humongous Rs60 crore every year on PR now. He has also exposed one more shocking example of Mr Tata’s pet investment with one of his friends gone bad for which Tata Sons has had to write off Rs1,150 crore. "...another significant difference was due to the cessation of services by Niira Radia (Vaishnavi Communication) who was being paid about Rs40 crore per year. She had been replaced by Mr Arun Nanda (Rediffusion Edelman) who had been brought in by Mr Ratan Tata at a cost of Rs60 crore per year for PR support just prior to Mr Mistry taking charge. It is worth noting that a part of this PR infrastructure was also provided to the Tata Trusts, while paid for by Tata Sons," the statement says. It says, "....the Tata Sons full-page ad of 10th November fails to acknowledge that Tata Sons was also bearing the entire office costs of the Chairman Emeritus, Mr. Ratan Tata. This figure was about Rs30 crore in 2015. A significant amount of which was for the use of corporate jets. This dual structure and attendant costs did not exist earlier." As per the statement, before Mr Mistry assumed the charge as Chairman of Tata Sons, several group centre (GCC) members held what were deemed 'non-executive' roles in Tata Sons. "As such, they, including Mr Tata, drew their compensation as commissions from Tata Sons instead of salaries, which skews base year comparisons. It is also public knowledge that several erstwhile directors of Tata Sons drew additional parallel commissions from operating group companies." "The GEC reporting to Mr Mistry, drew remuneration only from Tata Sons. No member including Mr Mistry took any commissions from any of the operating group companies. This arrangement was a cleaner and more transparent system to ensure that those involved in running the group were remunerated only by the group's core investment company and not by the operating companies," the statement says. Mr Mistry's office also stated that he added few senior positions like group chief technology officer (CTO) and group strategy head to enhance the group central capabilities for the future. Refuting allegation made by the Tata group that impairments indicate an inability to turn around inherited hotspots, the office of Mr Mistry says, "Mr Mistry did not approach any of the businesses with a view to do a quick cleansing so that he could immediately demonstrate decent results going forward." The statement says, "The impairments and write downs at Tata Sons were due to legacy issues, largely relating to Tata Teleservices Ltd (TTSL). There were also other investments of questionable nature such as Nagarjuna Refineries (Rs400 crore) and SASOL JV. One investment in Piaggio Aero, a company in the aerospace sector with a friend of Mr Tata, was especially distressing. Tata Sons decided to exit the company at a commercial loss of Rs1,150 crore. This was after the efforts of Bharat Vasani and Farokh Subedar who managed to recover Rs1,500 crore, overcoming the objections of Mr Tata who in contrast favoured increasing investments in that company. Today, the company is, for all practical purposes, nearly bankrupt". "The efforts of Tata Sons, under his leadership has always been to look at strategy, structure and leadership changes to drive operational improvements before examining mergers, exits or shutdowns. All the decisions taken in this regard were in keeping with the Tata values and with the full consent of the Board. The way forward on this front was documented in the board meeting minutes as well as the 2025 Group Strategy Document, which was presented to the Tata Sons at board meetings held as early as June 2015 then in, December 2015, and further iterated in June 2016," the statement concludes. There is no proper reason given by TATA trusts chair person Mr. Ratan Tata for removing Mr Cyrus Mistry from the post of Chairman of Tata & Sons Ltd.
Also, Mr Mistry should inform us (The public ) about the emoluments that He drew from his posts with all Tata companies and the emoluments that Mr. Ratan Tata and other directors draw from the companies. Tata Motors and other Tata companies are making losses - and yet the Directors are taking a lot of money from the companies. Behind Every Great Fortune there is a Crime. - Honere de Balzac. The famous book 'Godfather' begins with this quote. Crores of rupees are being wasted on PR by the TATA camp to humiliate Mr.Cyrus Mistry. Classic case of - SHOOT THE MESSENGER. The first thing shareholders shd do is get out of all Tata shares. I think it is time dept of Company Affairs (pun intentional) sets up a panel to go into these affairs in the interest of the common man shareholders of ALL TATA companies. If that is done many TATA stalwarts will gave to say TATA BYE BYE. It is difficult to comment, leave aside judge, when Mistry's side comes up with facts and figures in support of what they think while the other side, Tatas are either vague or quiet. Things are getting murkier. What is clear is that the principles of corporate governance, so far as the Board processes are concerned, have been thrown to the winds. We can only be silent spectators to this unfolding drama! One hopes that it will have a happy ending! "Tata Sons" or "Tata Step Sons" ? Mumbai: The independent directors of Tata Motors on Monday reposed their faith in Chairman Cyrus Mistry, while taking up the second quarter results for this financial year. In a regulatory filing with the BSE, such directors said they reviewed the recent developments in the group pertaining to their company. "The independent directors have confirmed that all decisions taken by the board with regard to the strategy, operations and business of the company have been unanimous and executed by the Chairman and the management accordingly," the company said. "The independent directors have further affirmed that the company continues to be governed, supervised and managed under the guidance and the direction of the board. The management of the company and its subsidiaries have the full confidence and support of the independent directors." Mistry is Chairman and Non-Executive Director of Tata Motors. The Tata Motors board has the following independent directors: Nusli N. Wadia, Raghunath Mashelkar, Nasser Munjee, Subodh Bhargava, Vinesh K. Jairath and Falguni S. Nayar. Other board members are: Ralf Speth, Non-Executive Director; Guenter Butschek, CEO and Managing Director; Ravindra Pisharody, Executive Director (Commercial Vehicles); and Satish B. Borwankar, Executive Director (Quality). On November 11, the company had informed the stock exchanges that it has received a notice from shareholders representing 26-per cent of the voting rights for the removal of Chairman Mistry and Independent Director Nusli Wadia from the company's board. Based on responses, if any, from the duo after they are furnished a copy of the notice, the company may have to call an extraordinary general meeting of shareholders for their removal, if they don't do so on their own. Tata Sons, the holding company of the Tata Group companies, removed Mistry, 48, as its chairman last month, saying that he had lost the confidence of the board due to several factors and that the trustees were increasingly concerned with the growing trust deficit. Last week, Tata Sons in a nine-page statement said the ousted Chairman should resign from all group companies and deplored the manner in which Mistry has sought the support of independent directors of Indian Hotels to continue as its Chairman. "Mistry conveniently forgets that he was appointed as the Chairman of the Tata operating companies by virtue of and following his position as the Chairman of Tata Sons," Tata Sons said in its statement. issued last week. As regards to the quarterly results, the Indian automobile giant reported a net profit (post profit/loss in respect of joint ventures and associate companies) at Rs 848 crore for the quarter ended September 30, 2016. The company had reported a consolidated loss after tax (post profit/loss in respect of joint ventures and associate companies) of Rs 1,740 crore for the corresponding quarter last year. The company informed the BSE in another regulatory filing that its consolidated revenue stood at Rs 67,000 crore during the quarter under review, up 6.94 per cent compared to Rs 62,647 crore during the like period of the previous fiscal.